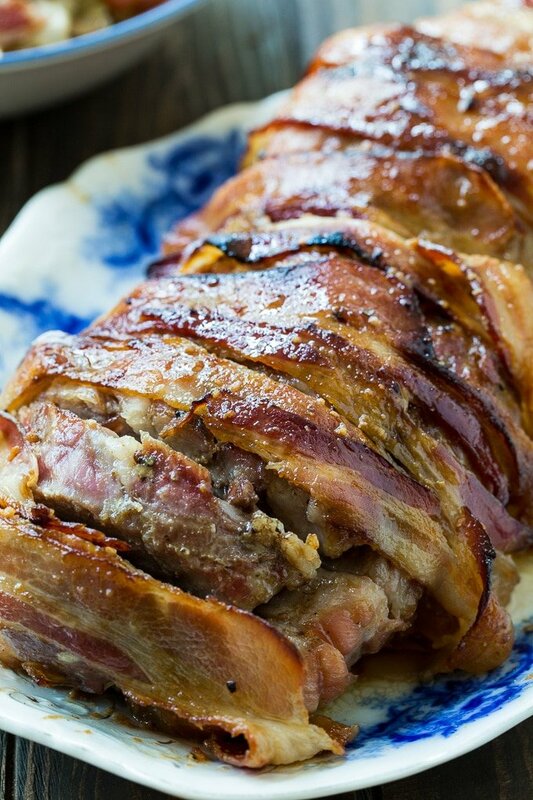 Bacon Wrapped Maple Glazed Pork Loin is smoky, so juicy, and sweet and spicy. Everything tastes better wrapped in bacon. Right? 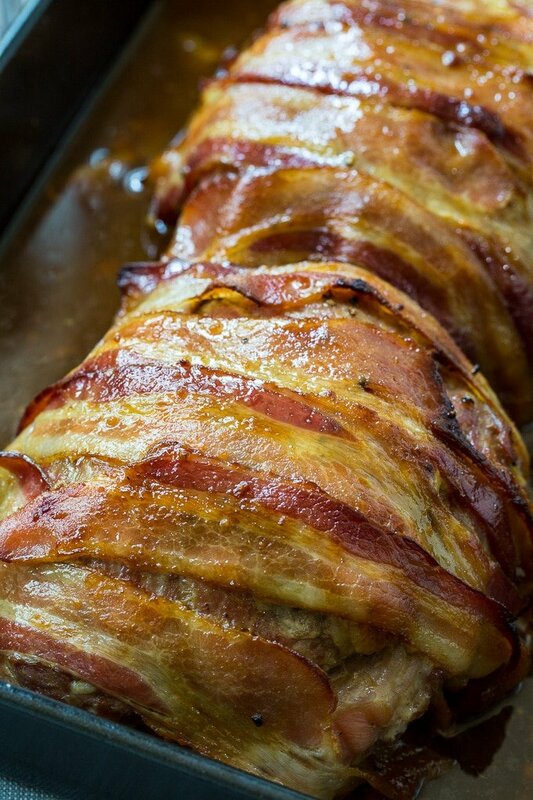 Bacon Wrapped Maple Glazed Pork Loin makes a great family meal. Especially for a large family gathering. Use a 4 to 6 pound boneless pork loin and it will feed a lot of people. Especially if you make a couple of filling sides to go with it like Super Creamy Mac and Cheese and Melting Potatoes. The pork loin gets coated in a maple/brown sugar glaze with Dijon mustard, soy sauce, Worcestershire sauce, and cayenne pepper. 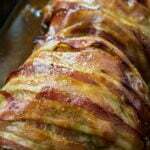 It is then wrapped in bacon and drizzled with more maple syrup. Place it in a roasting pan, cover with aluminum foil, and roast for 1 hour. Uncover it, baste it and roast 30 more minutes. Give it one more baste and continue cooking until the bacon if brown and crispy. Broil it for a few minutes if you need to to get it crispy. The bacon will cook up sweet and crispy and it really helps keep the pork moist. Plus it adds great flavor. This Bacon Wrapped Maple Glazed Pork Loin can easily be cut into thin slices and will feed a crowd. 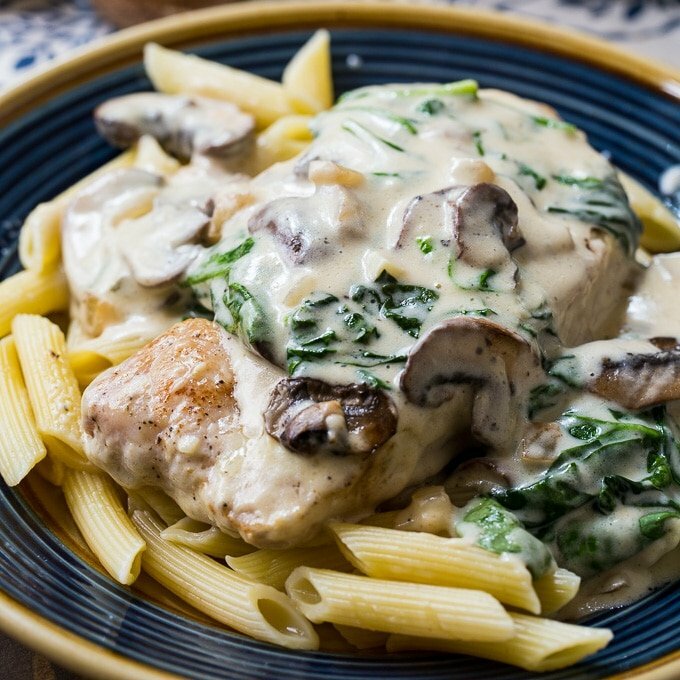 If you have an Instant Pot, this Pork Loin recipe is a great one to try. Bacon Wrapped Maple Glazed Pork Loin is smoky, so juicy, and sweet and spicy. Everything tastes better wrapped in bacon. The pork cooks up so tender and juicy! In a medium bowl, whisk together brown sugar, Dijon mustard, soy sauce, Worcestershire sauce, cayenne pepper and 1/4 cup maple syrup. Cut any excess fat off of pork loin. 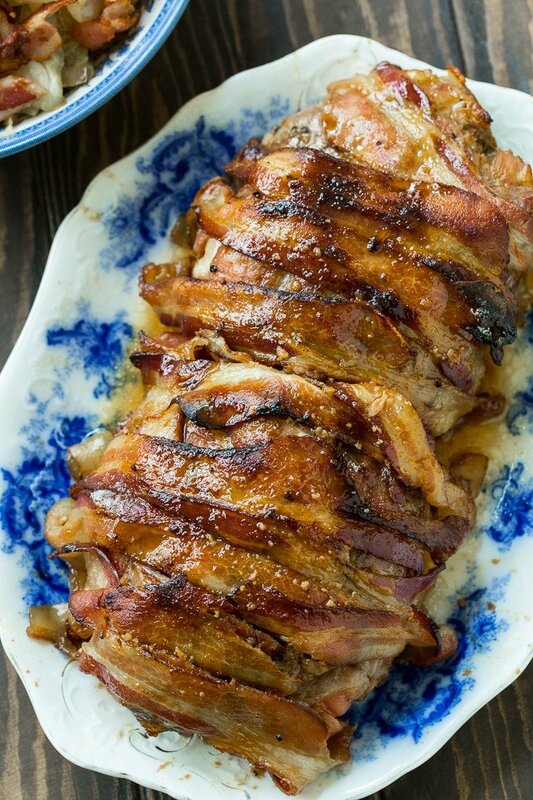 Place pork loin in a roasting pan. Season it with salt and pepper. Sprinkle with garlic powder. Pour brown sugar mixture over pork loin. Drizzle the remaining 1/4 cup maple syrup over the bacon. Cover roasting pan with foil and bake for 1 hour. Remove from oven, baste with the accumulated juices, recover and cook 30 more minutes. Remove foil, baste again and cook uncovered until bacon is crispy, about 20 minutes. This entry was posted in Main Dishes, Pork and tagged bacon, Pork. Bookmark the permalink. Maybe cut the temperature back? Then the last 20 minutes turn on the broiler to crisp up the bacon? I usually season with lemon pepper and onion slices and cook on low heat (280° ) for about 3 1/2 to 4 hours. Melts in your mouth so this is a new recipe for me. Fingers crossed! No wonder people in the south are so overweight. How would you modify the recipe to remove the sweet stuff (maple and sugar)? Good flavor. But way too well done. Need to cut cooking time in half. Made this tonight and OMG!!! Best meal I’ve ever made hands down!! Thank you so much for sharing this!!!! Well, they at least didn”t send you the picture of them basting you with garlic butter. Great Haiku!